Three meets in one weekend is nothing for the men’s tennis team. 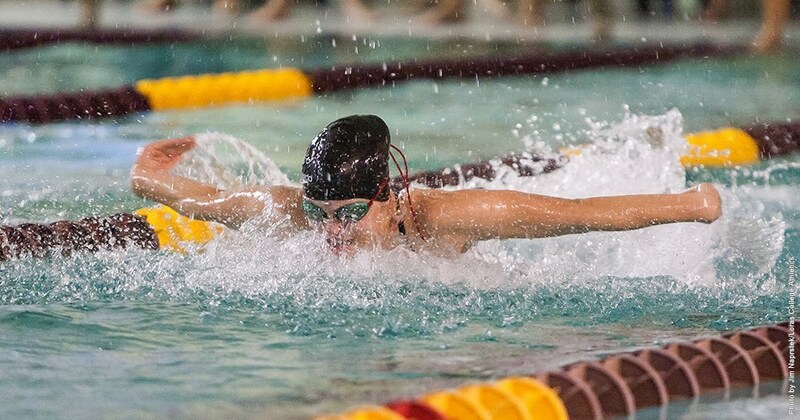 On Saturday, March 23, the men took on MSOE and Aurora, and on Sunday, March 24, they competed against Monmouth. Opening up the day in doubles against MSOE was the pairing of senior Charlie Harris and first-year Kevin Blomquist in the number one slot. It was a difficult match for them, and they ultimately lost against MSOE’s Nelson and Chon 8-2. The number two Duhawk team, consisting of senior Riley Michel and sophomore Ryan Scheidt, took on the team of Alec Dam and Connor Splingaire. Much like MSOE’s number one team, their number two pairing put up quite the fight, but they were unable to overcome the Loras pairing, who won 8-6. The last doubles match in the number three slot, which saw first-years Sage Klar and Tommy Linkenhold pitted against Curt Norton and Bryon Roob, ended with the Duhawks winning 8-4. Moving onto the singles matches, Harris started off the matches in the number one spot against Chon. After some strong rallies between the two of them, Harris walked away with the win 6-3, 6-4. Blomquist, in the second slot, took on Nelson, who gave him a run for his money, and defeated the Duhawk 7-5, 6-4. In the third singles match, Michel faced off against Dam. The first set was a tough one, but Michel took the win through a tiebreaker, and went on assert his dominance in the second set, taking the match 7-6, 6-2. First-year Joe Schneider, competing in the fourth slot, went against Splingaire. Schneider won the first set 6-4, but due to the opponent retiring due to an injury, they were unable to play the second set, giving Schneider the win. Scheidt had a rough go of it in the fifth slot. His opponent, Norton, got the best of him, but Scheidt went down swinging, both sets ending 6-4, 6-4. The final match, first-year Konnor Barth versus Parker Kuhlmann, saw the victory of Loras over MSOE, with the match ending 6-1, 6-4, in Barth’s favor. The second meet of the day was against Aurora college. With a little bit of experimentation thrown into the lineup, the first doubles match was Barth and Blomquist against LaPort and MacDonald. As a new pairing, the Duhawk duo did well, winning the match 8-5. Michel and Scheidt returned for number two doubles against Burrow and Mascha, and continued their win streak, taking the match 8-5. Number three doubles once again saw Klar and Linkenhold take the stage, and they crushed Aurora’s Rosencrans and Ritchie 8-0. First-year Riley Collins rallies with his opponent this previous weekend. 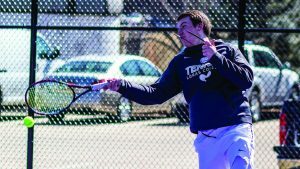 The tennis team is now 9-1 in the season, with its only loss coming to North Central. In singles, Harris returned for number one singles. In a one-sided match, Harris took down his opponent, LaPort, 6-1, 6-1. Likewise, Blomquist competed as the number two player, and he defeated MacDonald 6-3, 6-1. Things were switched up for numbers three and on, starting with Schneider stepping up for number three singles. His opponent, Burrow, stood no chance, losing to the Duhawk 6-1, 6-2. In number four singles, Barth took on Morrisey and dominated the court, winning 6-0, 6-1. First-year Riley Collins, stepping up for number five singles, took down Rosencrans 6-0, 6-2. The final match of the day, the number six match, was sophomore Connor Pivnicka against Mascha. Pivnicka won 6-1, 6-3, making it a clean sweep for the Loras team. The final match of the weekend against Monmouth opened up with Blomquist and Barth taking on Monmouth’s Harris and Joseph Shie. It was a close match, going into a tiebreaker, but the Duhawks persevered, winning 8-7. A new pairing, Michel and Linkenhold, took on the number two Andrew Shie and Guenther. Despite being a new team, the Loras number two team soundly defeated their opponents, 8-3. The third slot saw another new pairing, consisting of Pivnicka and Collins, who took on Martin and Robertson. Much like the twos, this pairing showed off their skills, winning 8-2. Much like the other meets, Harris opened up the singles matches at number one. His opponent was Joseph Shie, who bested the number one Duhawk 6-0, 6-2. Blomquist’s foe in the number two slot was Andrew Shie, who gave the Duhawk a run for his money. Each set of the match went to tiebreaker, and they ended it in a super tiebreaker. Through all that, Blomquist came out on top, the final scores being 7-6, 6-7, 10-7. Schneider, competing as number three, took on Monmouth’s Harris. It was a difficult match for the Duhawk, it ending in a loss 6-2, 6-1. For the number four match, Scheidt took on Martin. The match ended with Scheidt comfortably defeated his opponent 6-1, 6-3. The number five match saw Collins take on Guenther. It was a rough start, but Collins overcame the difficulties and took the win 7-5, 6-2. The final match of the day was Pivnicka versus Robertson. The Monmouth player couldn’t keep up with the Duhawk, giving Pivnicka the win 6-1, 6-0. At the end of the weekend, the men’s tennis team marked three more wins to their growing tally. The final scores of the meets were 6-3, 9-0, and 7-2 respectively. 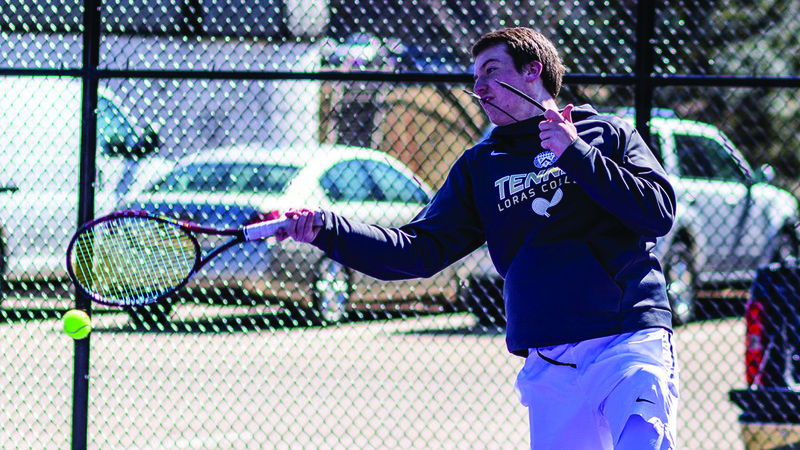 Next up on the schedule is the meet against Luther on Thursday, April 4, on the Loras College Tucker Tennis Courts.